Let’s consider where to eat a great brunch in Portland, which unassisted can be an overwhelming task. 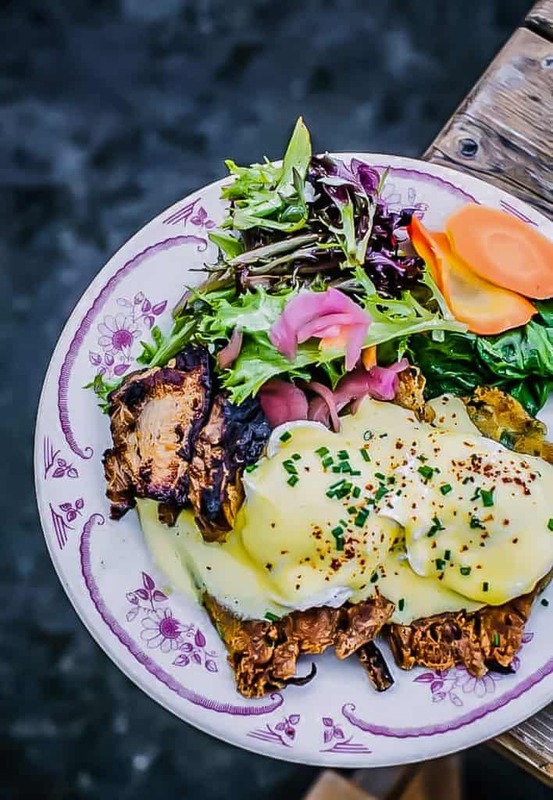 As you may know, Portland, perhaps more than any city in the U.S., has claimed brunch-as-blood sport status, and in fact just choosing 25 of the best brunch spots in Portland is dangerous. 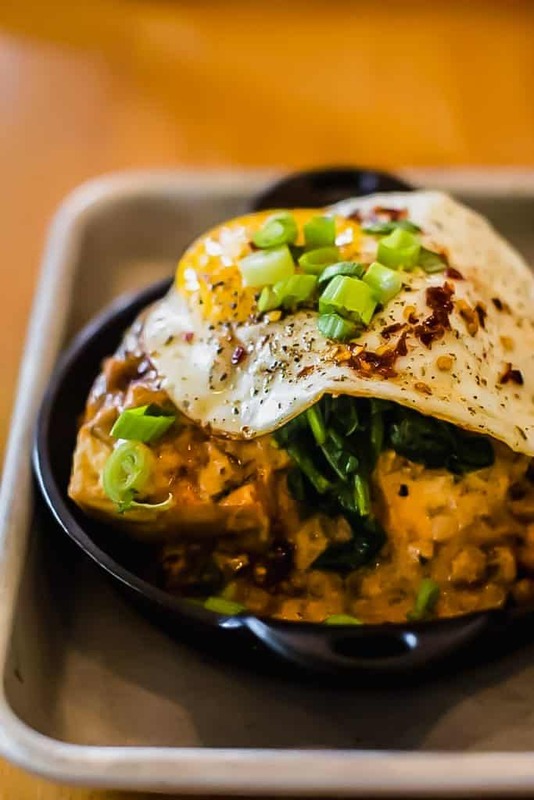 There are so many great places to eat brunch in Portland that it’s hard to arrive at 25 “best” spots, and judging from the wait at nearly all of them, you’d never guess that restauranteuring is a fickle endeavor. If you’ve seen the brunch village episodes in Portlandia, consider that an accurate, if somewhat ridiculous, portrayal of what it’s like to eat brunch in Portland at one of the many popular and delicious restaurants here. But it hasn’t always been so. Historically the mid-morning meal that came to be known as brunch was borne of humble family origins and often enjoyed at the family table after worship services or, in the case of indulgence or special occasion, at a local restaurant on holidays. 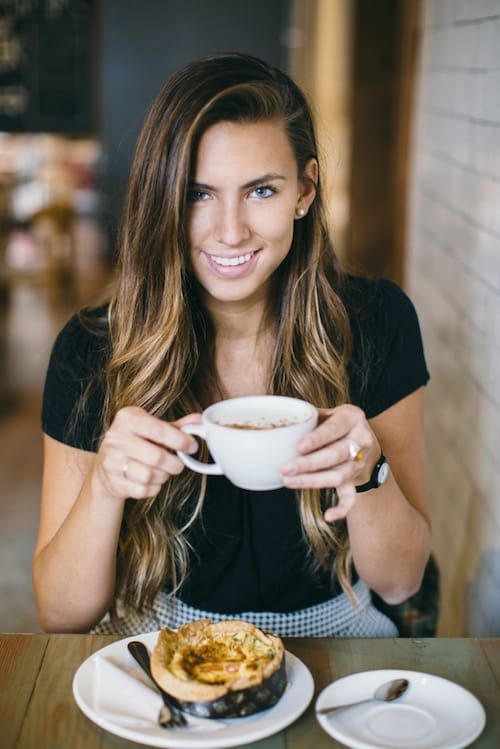 With shifting cultural, economic and demographics at play over the years, modern brunch is more of an Urban Millenial zeitgeist marker, a preferred means to spend disposable income, a more viable budgetary option for dining out as compared with dinner, a time for socializing and often a time to ease out of hangover and into a civilized weekend. We now have brunch metropolises and Portland is one of them. Therefore if you are on the hunt for a delicious brunch in Portland, you will need this list of the the top 25 spots. We’ve compiled it to save you from overwhelm when searching and to help you navigate according to your cravings and transportation options. 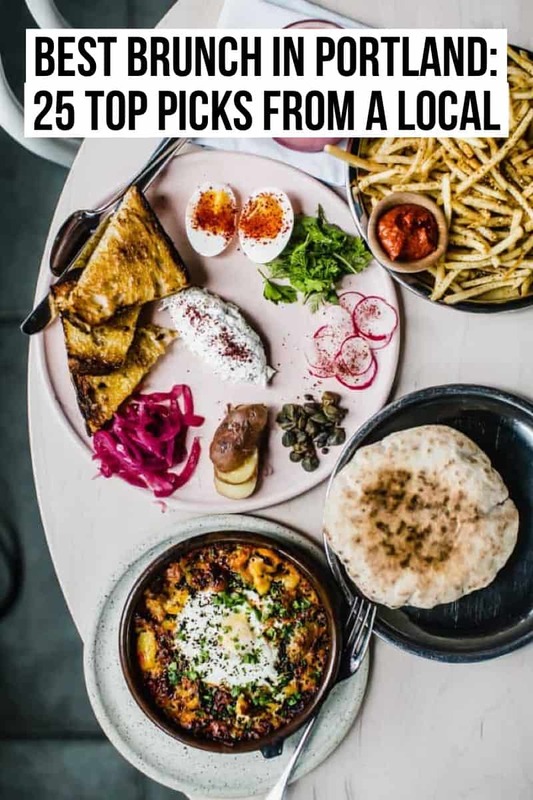 When deciding where to eat brunch in Portland, for this list we’ve not included food trucks or carts, dessert shops, hotel restaurants, or chain restaurants. Also excluded (sorry Proud Mary, Broder, Sweedeedee, Podnah’s, Pepper Box, more) are restaurants that do not offer a specific “Brunch” menu but rather “All-Day Breakfast and Lunch” menus. We’ll highlight those in our upcoming post on Portland breakfasts. Similarly not here are itinerant and seasonal pop-ups (Mae). Now, if a restaurant is open during breakfast and lunch hours with no defined menu, we have included it as a brunch restaurant. Finally, with one or two rare exceptions, we did not include places that have been open for less than one year. Restaurant business may seem strong but behind the scenes could be more fragile than we realize and we wanted to ensure our recommendations have longevity. It is important to mention that we sampled the popular spots, including the mob-scene brunch places, the formal and casual restaurants, and everything in between. There are so darn many places to eat brunch in Portland that are very popular and serve delicious morning fare that aren’t on our list, solely because we didn’t think the food was as good as that of the restaurant that we did include in its same category (in other words, we’ve only included one restaurant per “category”). Phew, now onward! Portlanders have Verdigris, included in our Top 40 Restaurant list, Bergerac, Petit Provence, and Chez Marin for french food brunch options, but we are loving the very hot Canard on Burnside, which is not only open for weekend brunch, but also during the week every day for breakfast (and many of those same brunch menu items). Canard sits next door to its sister restaurant Le Pigeon (also on our top 40 list and our best burger list) from the same owner and chef, two-time James Beard award winner Gabriel Rucker (Best Chef Northwest 2013 and Rising Star Chef of the Year 2011) and not only hit our best 40 Portland restaurants, but is one of our best Portland brunch spots for sophisticated yet playful French morning fare. 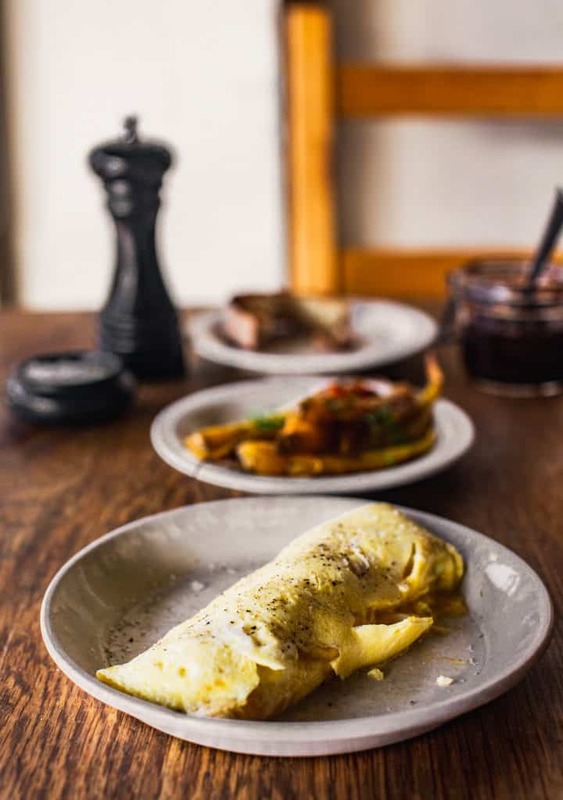 Definitely try the perfect omelette with goat cheese and fine herbs, the Oeufs en Mayonnaise with trout roe, bacon, roasted garlic, and smoky maple or, if you’re feeling wild, go for the Duck Stack with pancakes, duck gravy, tabasco onions, a duck egg and do add seared foie gras. Wink. 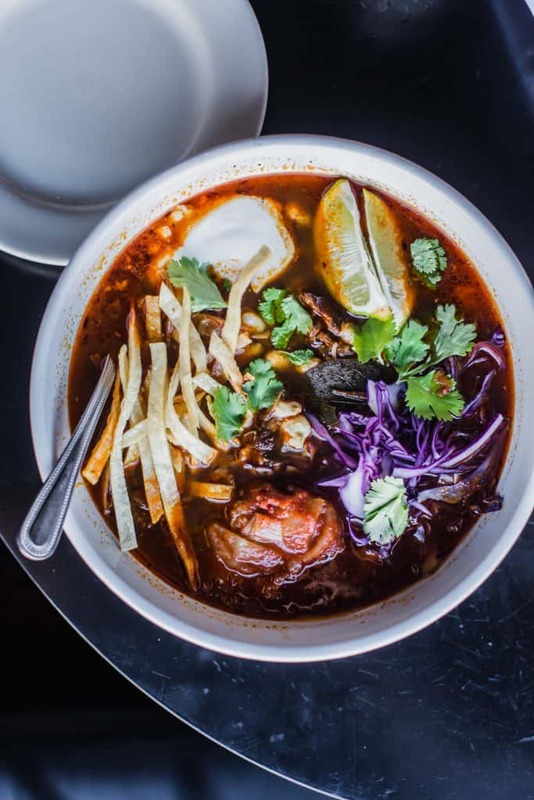 The bowl of Pork and Kimchi Pozole above may not be French, but it is one of the best brunch bowls we’ve eaten in Portland. La Moule is the place to eat brunch in Portland if you want classic French fare such as a perfect omelette, a perfect croissant, quiche, waffles or their must-try mussels in broth with baguette. If you’re feeling adventurous, go for the Pozole or their Burger with Thick Bacon and Brie. Not to miss: Beignets! 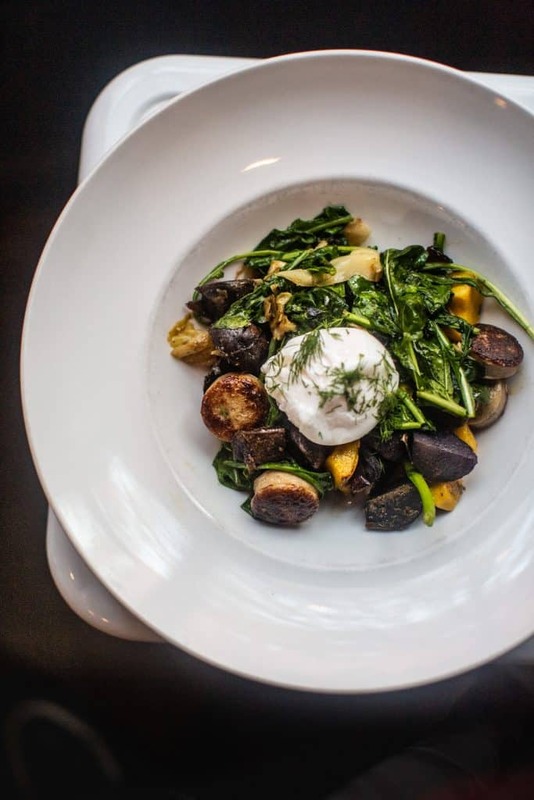 We are huge fans of relative newcomer Kingsland Kitchen for their proper English breakfast dishes as well as solid and creative takes thereon, and its convenient downtown location (across the street from the newly remodeled Stumptown Coffee). We think it’s one of the most solid and accessible places to eat brunch in Portland. 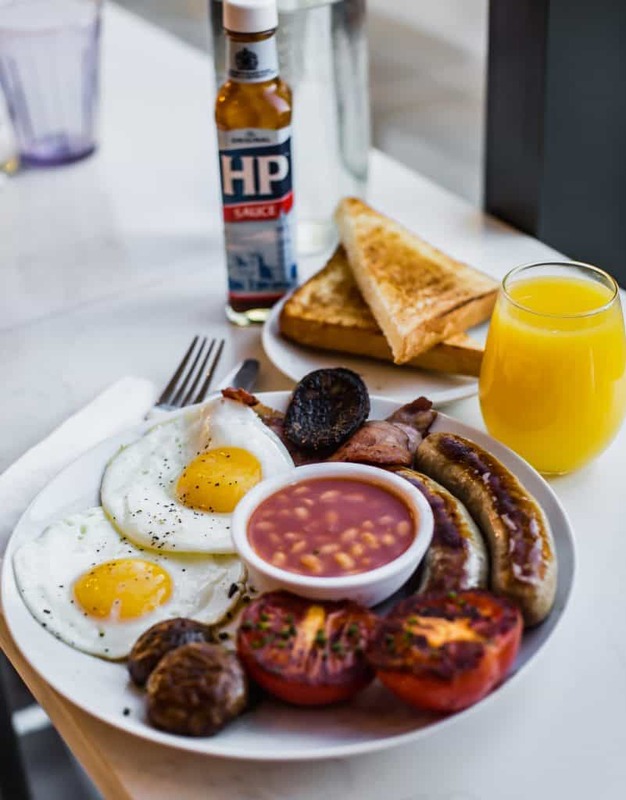 Kingsland has an open and spacious feeling with plenty of seats to feed your crowd or just you, if you’re in the mood for the full English of bangers, eggs, roasted tomatoes and mushrooms, baked beans and HP Sauce (veggie option too). Also available on their large menu are a Pub Biscuits and Gravy, Guinness Braised Beef Brisket Hash, a million breakfast sandwiches, fun open-faced toasts such as the Avocado, the Eggy and the Veggie Full English Breakfast Toast. Or how about a nice Tandoori Naan Sandwich with back bacon, over-medium eggs cream cheese, tomato chutney, cilantro; perhaps a Boozy Double Brunch Burger; or a Three-Cheese Grilled Cheese with onion and mushroom with tomato soup? With so many good taco options around town you may think it would be easy to find a great Mexican brunch in Portland. But options for proper brunch in this category are somewhat scarce. We absolutely love the tiny Oaxacan outpost Autentica on 30th & Killingsworth in Northeast Portland. Sister restaurant to the wonderful Uno Mas Taquiza, Autentica is where you want to go for an authentic mole or some delicious homemade chorizo. Start with the very messy but shareable Queso Fundido dip with chips. For entrees, choose from Huevos Rancheros, Chilaquiles, Sopes, Enmoladas and Entomatadas and Enfrijoladas (“folded” homemade tortilla dishes), lots of Arroz-Con dishes and an epic Carnitas Torte with pickled jalapeno. Note that Autentica is only open on Sundays for brunch, so plan accordingly, it will be worth the special trip. If you’re thinking, “Oh great, a bakery, there won’t really be a line like at a traditional restaurant,” you’ll be wrong at Heim Bakery. Heim opened a short while ago to immediate lines and sell-outs. Not to despair, the food is worth your wait, and you can sip coffee in line. Heim Bakery is a cozy shop in the North and very Eastern Roseway neighborhood of Portland. Newly opened just over two month ago, Heim, which translates in German as “Feeling of home; not attached to a physical place but to a memory, a sensation, a longing,” is exactly as its translation confers. Its two rooms feel more of a home dining room than a restaurant, with old plush furniture, mismatched chairs and tables and bookshelves lined with the best cookbooks. 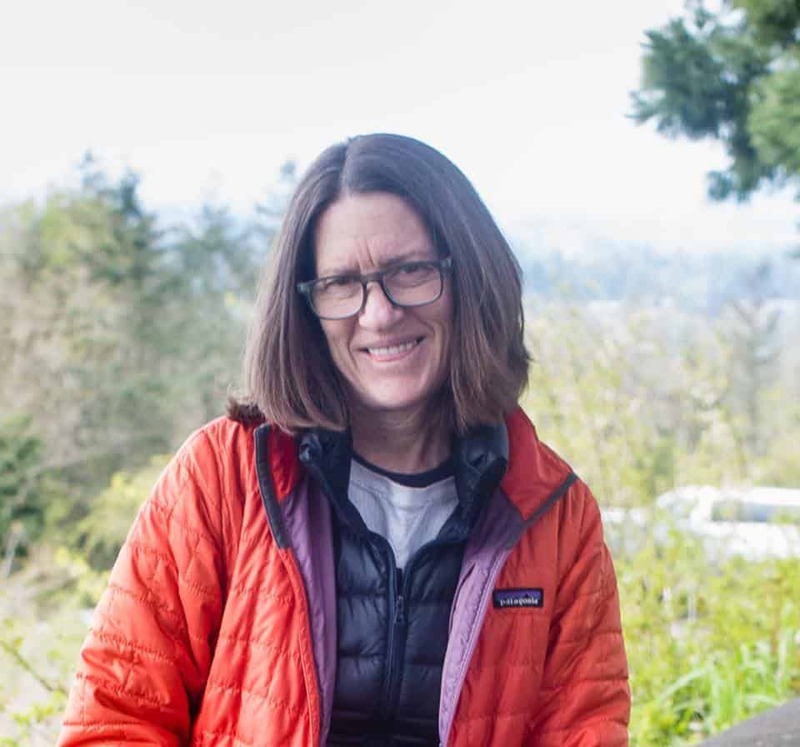 Owner and baker Jenn grew up in Germany and trained as a sweet baker and pastry chef in Munster, then did short stints in Paris and London before putting down roots in Oregon. At Heim the menu is simple. Order a sweet or savory board of bread and its accompaniments and you’ll get three types of sliced toasted bread, salami and proscuitto, blueberry wrapped goat cheese, olives, marcona almonds, pickled radish and peppers, mustard and butter; or a selection of sweet spreads, soft cheese and fruit; or go simple with butter, homemade jam and nutella. If you are a party of one, try the Avocado Toast or a simple toast with a almond butter and jam or a fried egg. There’s a sourdough waffle named “Herman” that comes sweet, savory or simple as well. Grilled cheese, a seasonal sandwich, soup, granola, quiche and a hash round out the menu and by all means do not pass up the pastry case displaying all manner of goodies from authentic German streudel to pie, scones, cookies and cakes. Although Heim Bakery is new in town, it is already one of our very favorite places and will be serving hungry Portlanders for many years to come. 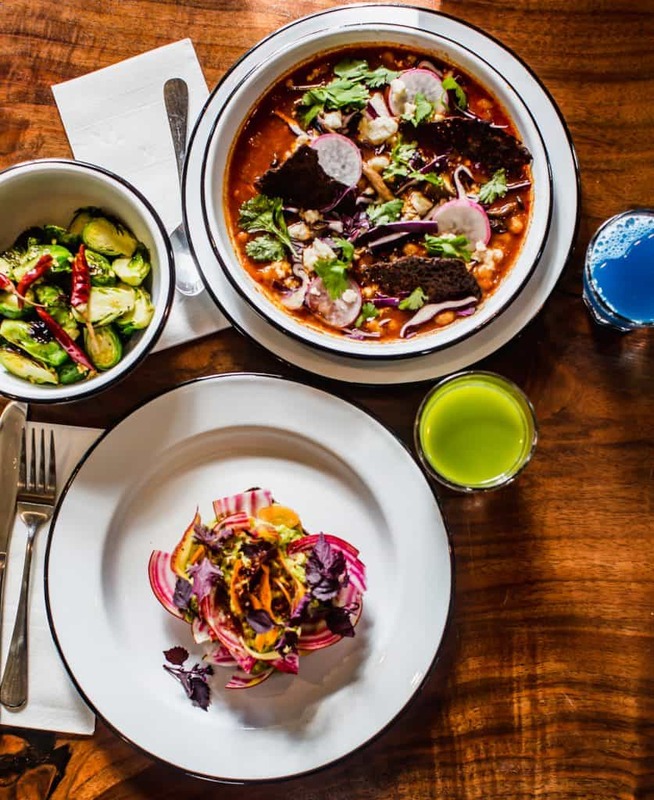 Holiday is the new stylish vegetable centric daytime eatery of Duane Sorenson, Stumptown Coffee’s originator and former owner and quite literally the man behind third-wave coffee in the U.S. He quietly and without notice took over the beloved Roman Candle Baking Co. space and filled it with jungle plants, juices and gluten free baked goods. The story is that with his new sober lifestyle came a devotion to healthy eating and drinking that Duane wanted to share with the folks he’s been feeding for years at his other restaurants such as Ava Gene’s and Woodsman Tavern. Gone are the wood-fired pizzas but the beloved giant community table is the center of the space, with a few outdoor tables and a line of stools drawn up to the restaurant’s southern perimeter. Holiday has hit the boho vibe nail on the head, yet the service remains sharp, warm and energetic. Also the toasts and bowls the crew is turning out are served up as if in a contest for Instagram as high modern art. In a smart move, Holiday makes eggs and regular cow’s milk available for those who want a little wood-fired scramble with chermoula to warm them up, or want their mushroom latte with traditional dairy. The breakfast bowls are imaginative and vibrant, with nods towards Pozole and Bibimbap. Recently I sampled the utterly delicious Rojo Bowl with hominy, chili, foraged mushrooms, cashew cotija and black bean crisps topped with shaved radish and cilantro. There are lots of gluten-free breads, scones and muffins in the pastry case, as well as smoothie bowls that will hit every antioxidant and super-food need you’d have for a weekend. There are pancakes, roasted veggies, crepes and salads too . . . the menu is living and changes according to season and creative impulse. Holiday is a wild success and an undisputed best brunch spot in Portland. Looking for a small space to share an intimate yet casual brunch with lots of options for sides and baked goods for brunch in Portland? Try the diminutive indie-retro Milk Glass Mrkt. on a quiet corner or NE Killingsworth. 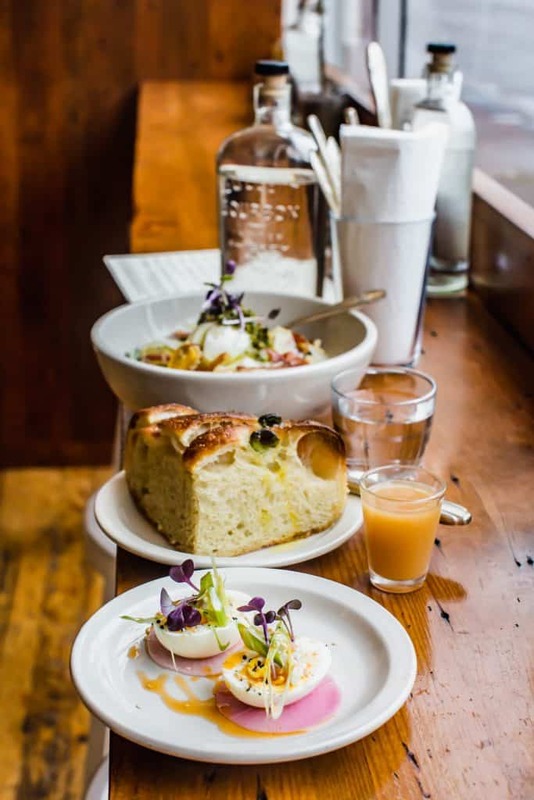 Easily a contender for best Portland brunch in general with a small, market driven menu and lots of healthy options, Milk Glass Mrkt is a local favorite. Portland food truck/cart pioneer Nancy Benson (Moxie Rx RIP) opened Milk Glass Market opened in 2014 to showcase her stellar baked goods such as her famous cheddar biscuits, as well as locally sourced ingredients in creative entrees such as multi-ingredient ramen and grain bowls and a Smoked Trout Plate served with a 7 minute egg, crème fraiche, picked beets, house kraut and capers with farm veggies and whole wheat crackers. Not to miss for Portland brunchers is the 8 Minute Snack Egg with white miso mayo, pickled daikon, furikake and pea shoots, the cheddar biscuit and ALWAYS a wedge of the Olive Focaccia. Bonus points for weekly off-menu blackboard specials, the expertly curated cupboard and cooler full of artisan pantry items (gut shots, Italian pasta) and the stylish room décor including those frosted art-deco skyscraper pendant lamps. Tannery is a cozy little neighborhood spot in North Tabor with a killer DJ station including of course vinyl but also 8-track cassettes, and an amazing choice of brunch entrees including Steak and Eggs, Fried Chicken and Waffle, Chicken Fried Steak, a Shrimp Omelette and the sublime Tannery Burger. This is where your local insider eats brunch in Portland. 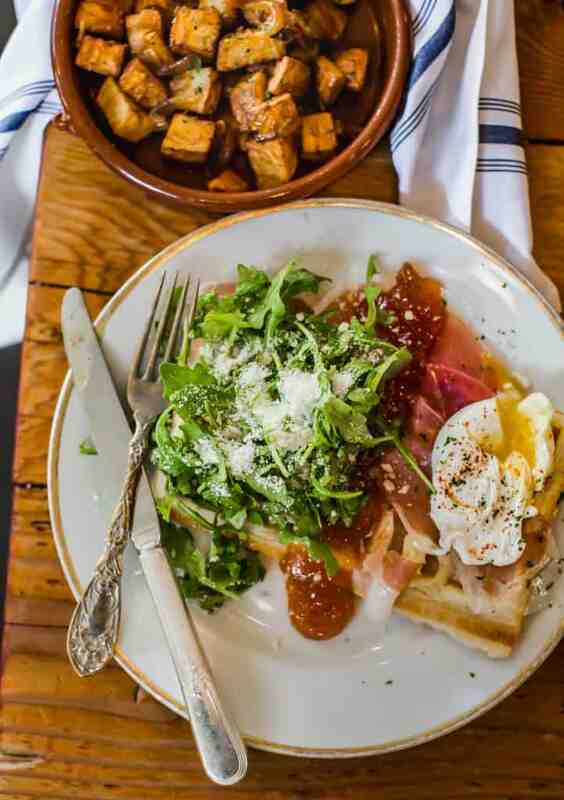 Besides Tannery’s hearty entrees, you can also get a classic egg + meat + potato and toast or waffle breakfast, but we’re loving the Morricone Waffle with Mascarpone, Lomo Ham, Arugula, Poached Egg and Apricot Preserves. Bonus points for community tables only therefore encouraging you to make friends. Rose VL is a Portland treasure, a true family-run authentic Vietnamese spot slinging out soup 6 days a week. Rose is the one outlier in our list of choices for brunch in Portland because they don’t have a “brunch” or even a “breakfast” menu, they do not serve what many of us would consider traditional morning or brunch fare, and they are closed on Sundays. 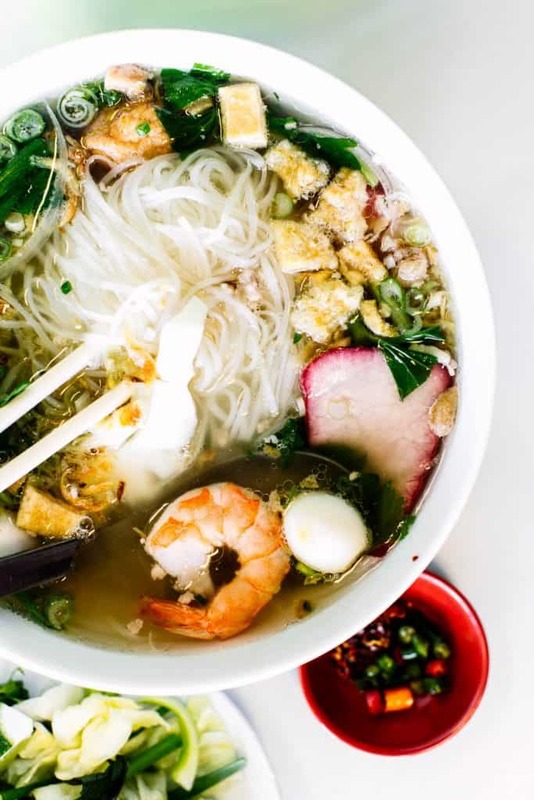 Yet many OG Portlanders consider the Pho at Rose VL an essential Portland brunch experience. The soup is phenomenal and really hard to describe in words. It’s satisfying in a way that no chicken and biscuits or order of pancakes or eggs can be. Warming down to your bones. You have to go for yourself and see – the menu is different each day but stays the same – go on Saturday for the Special Vietnamese Yellow Turmeric Noodle Soup, or try the local favorite VL Special Soup that includes shrimp, fish balls, ground pork, sliced pork liver, and sliced bbq pork with rice noodles and more pork broth on the side. Bonus points for extra cleanliness and super friendly service. Interurban is a dark soul of a brunch place with lots of rich hardwood walls, leather chairs and taxidermy, a mysterious straddler between bar and restaurant, that serves boozy morning drinks and brunch fare on one of my favorite food streets in Portland, N. Mississippi. I may have discovered it due to its next door proximity to my favorite pizza place in Portland. Go for the Poppy Seed Lemon Curd Pancakes, a Fried Chicken Biscuit Sandwich, a basic eggs and meat plate, or some creative hashes (rabbit) and rancheros and DO sit out on the covered patio between the two fire pits. Kids, dogs and smokers are all welcome on the patio. If you prefer inside, there are small tables at the streetside window, tables at the window and the walls upstairs, and a nice large L-shaped bar. 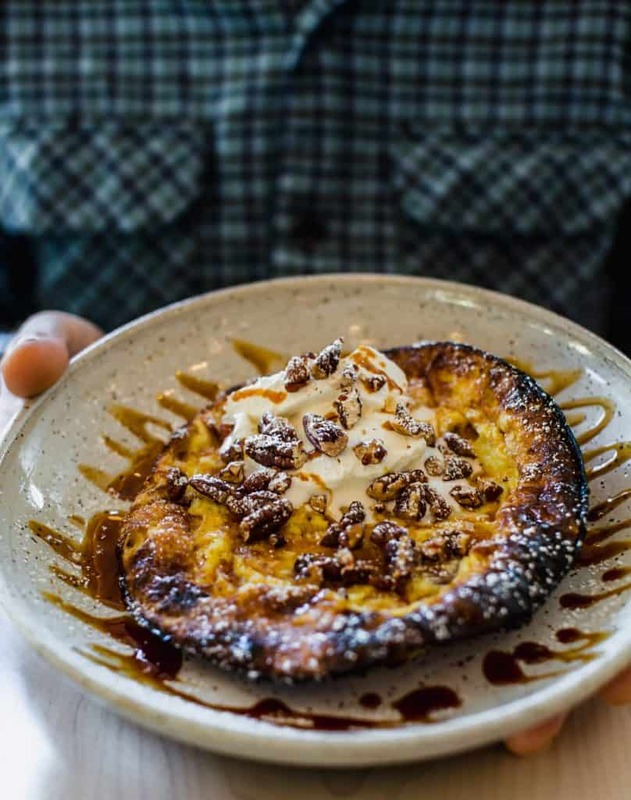 Interurban serves some neat brunch offerings including oysters, steak and arepas, biscuits and gravy and a decadent but not gut-bombing salted caramel french toast. 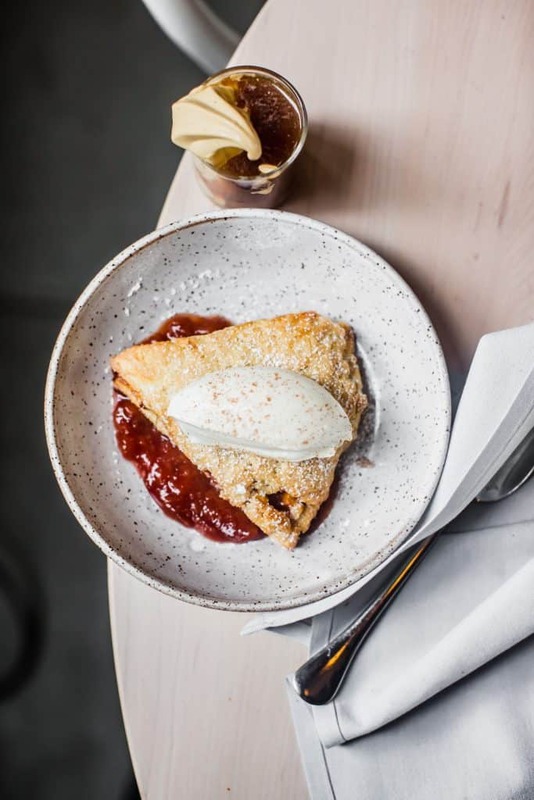 Coquine is one of the five to ten places that will always pop up when you ask a Portlander where they should go for brunch. And lunch and dinner for that matter. But back to brunch. You can have a famous buckwheat biscuit with homemade butter to start. They always have a seasonal pancake. And their cookies are world famous and available for pre-order. Coquine has a changing menu, but for brunch you can expect things like their Cacao Nib Hazlenut Granola, Seasonal Veggie Hash, Breakfast Sandwich with Fried Egg on Brioche, Croque Madame, and Seasonal Sourdough Pancakes. For snacks you can get Oysters, Griddled Cornbread, the famous Chickpea Socca (above), seasonal salads and soups, and our favorite, the Bologna and White Bread with Yellow Mustard and No Crusts!!! Do yourself a favor and peruse next-door Mt. Tabor park, one of Portland’s greatest treasures, after your meal. Navarre may go hidden in your Portland brunch searches and that’s why we’re including it in our list. 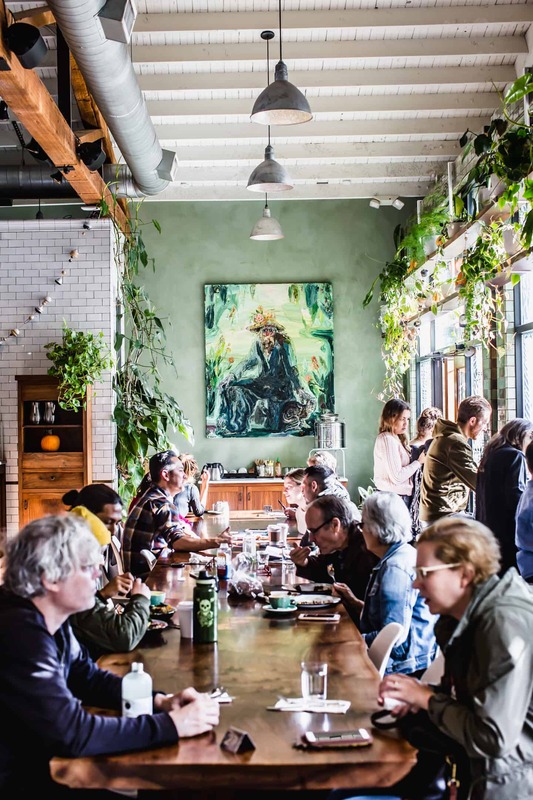 It’s the quiet, unassuming place, an essentialist’s dream, where you go for brunch in Portland good food and not a lot of noise or commotion. The food is perfect with no frills and nothing to prove. Navarre’s ordering concept is one of our favorites – everything is treated as a “side” and you order sushi-style, by marking on a sheet of paper. Dishes are simple and restrained. Omelette; Carrots and Dill; Bread and Butter with Homemade Jam; Liver Pate; Fish en Papillote. Always try the special fish served in parchment, and anything preserved or pickled, as well as any of seasonal vegetable dishes, and the bread with any choice of accompaniments whether meat and cheese, or butter and jam. 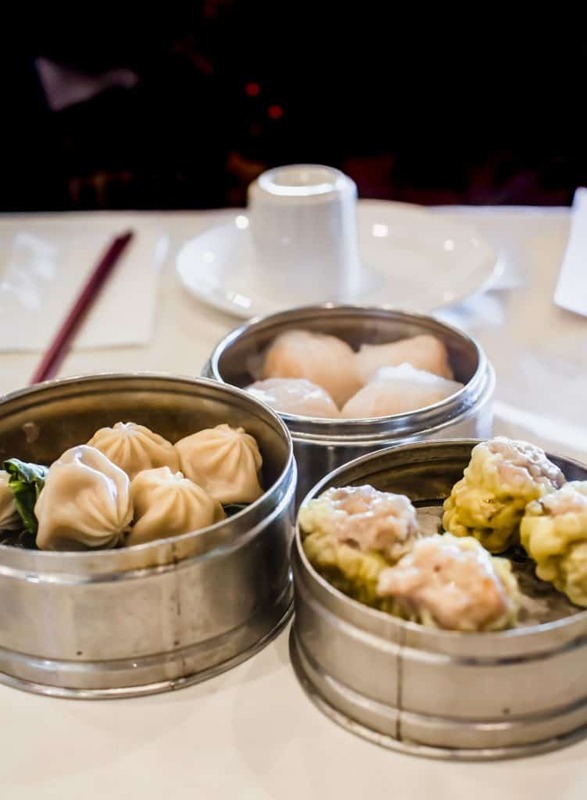 Are you looking to eat Dim Sum for brunch in Portland? Well, Portland’s best in this category is the happy, fast-paced and boisterous rolling-cart emporium, HK Cafe. HK sits in a giant strip mall deep into southeast Portland. HK is a great option if you’ve got a large party because they’re equipped to seat and feed a lot of people quickly. Once you’re seated, that is. Getting seated is another matter, for HK rivals many of our other best Portland brunch spots in terms of waiting in lines. You will wait. But it will be worth it. Order one of everything, from the Har Gow and Shu Mai to the Duck and Chicken Feet and drink plenty of tea. Hunnymilk was born as a pop-up brunch restaurant inside of La Buca, just steps north of Navarre on 28th Street which is one of Portland’s best dining streets. It quickly became a favorite spot for brunch in Portland, so much so that just this past month they opened a brick-and-mortar place on Burnside and 19th between Goose Hollow and the Alphabet District where they’re serving up a price-fixe brunch of one drink, and one savory and sweet entree for a very reasonable price. If you have to wait at Hunnymilk, often they’ll carry around a tray of goodies to nibble on while you sit or stand. We love the fixed order concept here with savory options like the Crispy Pork Ribs with cheesy garlic grits, soft egg, avocado and parsley-hazelnut pesto or Buttermilk Biscuits and chorizo gravy with a sunny fried egg, spicy maple syrup, and bacon fat wilted spinach; for sweets try either the Fortune Cookie Waffle dipped in honey butter with vanilla bean mascarpone mousse, raspberry, banana and strawberry puree or the Poppy Seed Crêpe with key lime curd, coconut-yogurt semifreddo, white chocolate magic shell, blueberries and brûléed kiwi. Menus change with the seasons and whims of the chef but you’ll always be assured a best quality Portland Brunch at Hunnymilk. Oh Radar how we love thee. 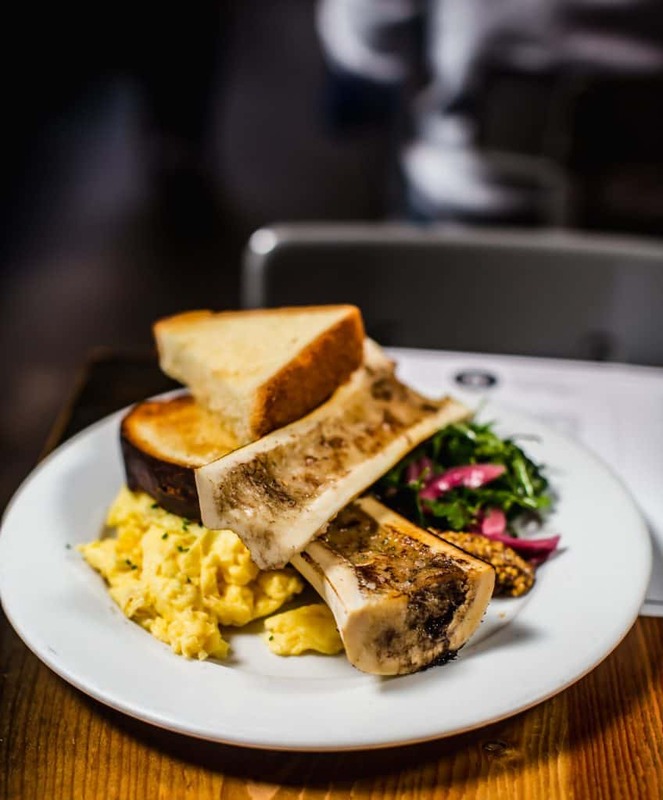 Where else can you go to eat a giant marrow bone with your toast for brunch in Portland? Radar is a relatively new, narrow and stylish neighborhood spot on Mississippi in North Portand, another rare place where you can score a full English Breakfast complete with bangers and blood pudding. Radar has an amazingly broad and large (but not too overwhelming) menu of brunch in Portland with big-hitters such as Steak and Eggs, Potato Cakes, a Gravlax or Brisket Plate, Beef or Fish or Veggie Hash, Biscuits and Gravy, a Chorizo Scramble, Omelette, Baked Eggs, a Croque Madam, Smoked Pork Shoulder and on and on. Or how about a plate of nice Scotch Eggs, some Bluefish Pate with deviled eggs, or Quiche? Feeling sweet? Try the Cinnamon Sugar Fry Bread, Baked Grapefruit or a Seasonal Fruit Clafoutis. 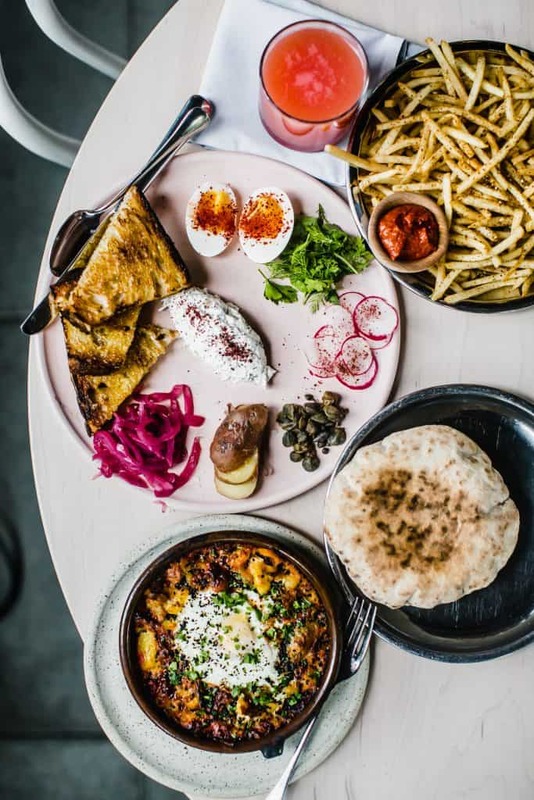 If you’re looking for an impressively varied menu and lots of delicious options, definitely head to Radar for brunch, they’ve got something for everyone. Are you looking for an elevated version of the basics for your brunch in Portland? Head to Perlot in the Beaumont-Wilshire neighborhood, a relatively new and elegant spot that serves brunch on the weekends including what we consider to be the perfect Benedict. Choose from ham or crab. Perlot will also cook you some Steak and Eggs, two different omelettes, a Smoked Brisket Hash, a Biscuit Sandwich. Also worth trying is Perlot’s Chorizo and Gravy biscuit plate, Belgian Waffles, Creamy Grits and Eggs, a killer Pork Belly Philly, and one of the best burgers we’ve eaten recently in Portland. 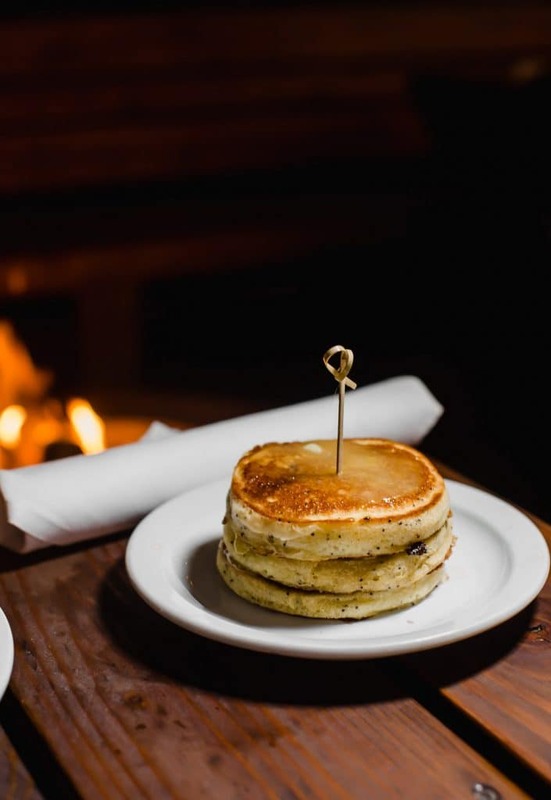 Do you want to stretch out by the fire at brunch in Portland? Or perhaps sit at a large community table? How about a spot at the long bar or a table at the windows lining one entire wall? Head to Irving Street Kitchen, a hip spot in the heart of the Pearl District whose name is a nod to the authenticity of Julia Child. 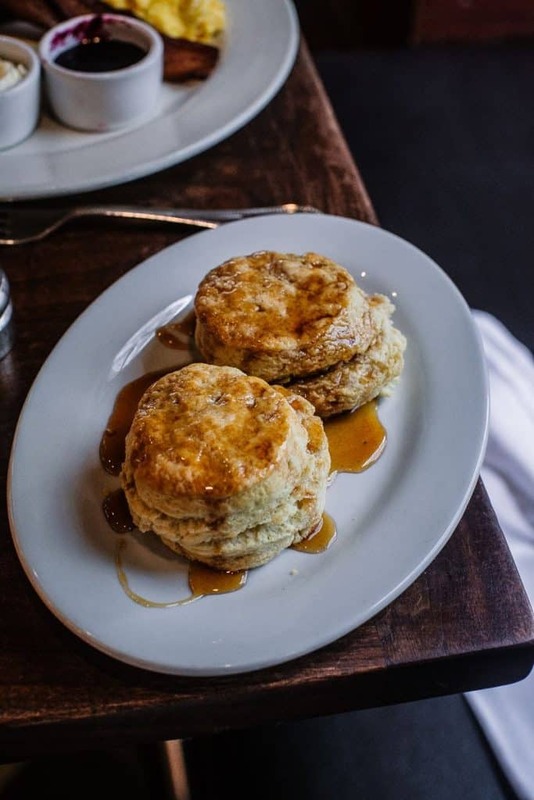 Irving Street Kitchen serves some of our favorite biscuits in town, so try the straight-up Buttermilk Biscuits with House Spicy Honey. 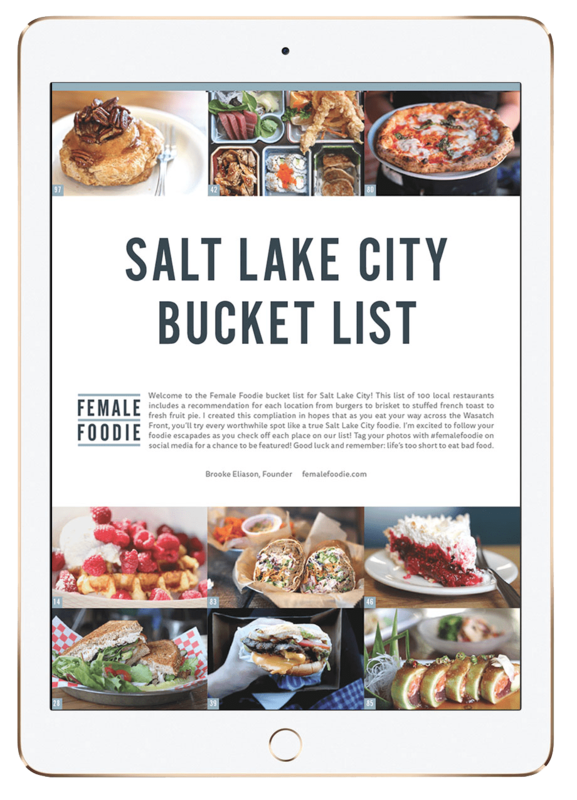 You can also grab all the brunch standards from sweets to eggs to griddle and then walk around the Pearl District to do some post-meal walking and shopping. For starters, try the Sugar and Spice Donuts with your biscuit, or a bowl of Cheddar, Bacon and Stout Poutine; share an order of Pumpkin Sage and Brown Butter Waffles, or try our favorite, the Impossible (Vegan) Patty Melt with Malt Vinegar Onions, Pickles & Iceberg, Miso-Cashew Cheese served with Harissa Aioli, Cajun Fries, Whiskey Ketchup. Not impressed? How about a Fried Chicken Sandwich, or the Jackfruit Cakes Roasted Cauliflower, Romanesco, Kabocha Squash Puree, Sunny Egg, Golden Raisin, and Scallion. The home of one of our best burgers in Portland is also home to one of the best brunches in Portland! On Saturday and Sunday you can have a Grain & Gristle’s mind-blowingly good burger starting at 11, and even though you get french fries, also order the famous Salt Potatoes – some of the best potatoes we’ve tried in any city. Also not to miss is a slice of Anadama Toast, which you can get with the basic Two-Eggs-Your-Way breakfast, or you can go crazy and order the Pastrami Sandwich with fried egg or the Pork Belly Hash. On the sweet side there’s a tart of the day as well as the stunningly good Blueberry Bacon Pancakes with honey butter. We love Grain and Gristle because it’s a true neighborhood joint, on a small and uncluttered corner of Prescott near the Alberta District where you don’t have to fight the masses. Pine State Biscuits is one of the several places tourists will always end up because it is so well known and loved, easily a best Portland brunch qualifier. With three locations (Division, Schuyler and Alberta), Pine State still sports huge lines on the weekends so arrive at opening time (bonus: 7 a.m. Monday through Sunday) and you won’t have a problem; arrive at 10 a.m. and you’ll wait a long time. But the biscuits are worth it. Pine State serves up mostly biscuit sandwiches but if you’re not in the mood for a biscuit you can also get extraordinarily good pancakes, hash browns, pie and cinnamon rolls. Pambiche is a cheery and festive high-ceilinged Cuban restaurant on Glisan St. (near 28th) between the Kerns and Laurelhurst neighborhoods. 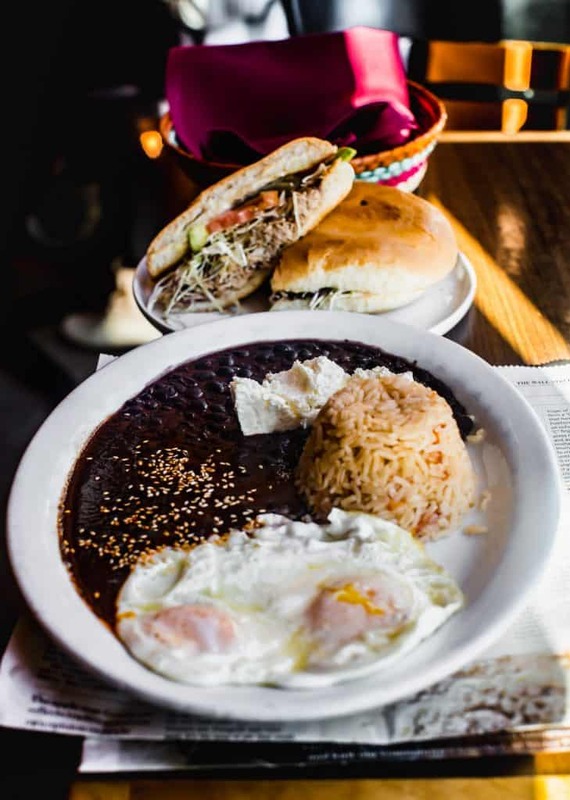 If you’re looking for a best Portland brunch, Pambiche is where you should go for atypical morning fare like the “Typical Cuban Breakfast” of pan tostado (buttered, grilled Cuban bread) and café con leche. Cubans typically dunk the pan tostado into the café con leche, as Americans would dunk doughnuts into coffee, so that’s what you should do. Feeling hungrier? Try the Cuban French Toast made from bread drenched in custard and grilled in sweet butter served with spiced sugar cane syrup and tropical fruit salad. 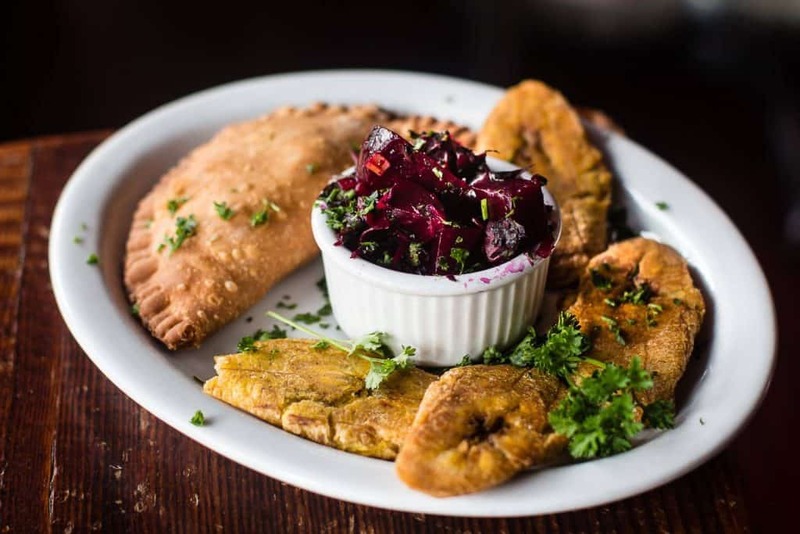 Or try the Rice & Eggs, the Cuban Style Eggs with ham, codfish and potato croquetas or fried plantains, the Cuban Steak and Eggs, the Cuban Hash and Eggs, or order an empanada from the pastry case. Our favorite is the Basque Omelette with parsley peppered eggs, bacon sofrito, Gulf Shrimp, green peas and yuca root. 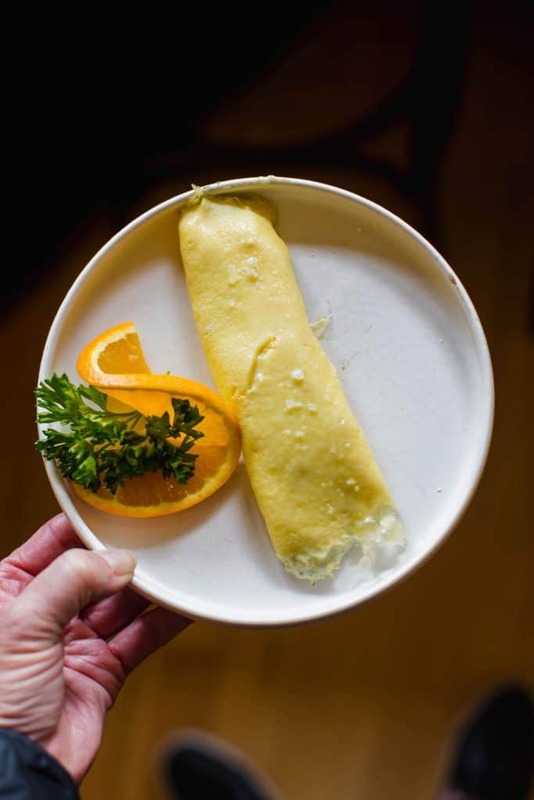 Truly a local favorite, Pambiche is one of our favorites for brunch in Portland on this list. 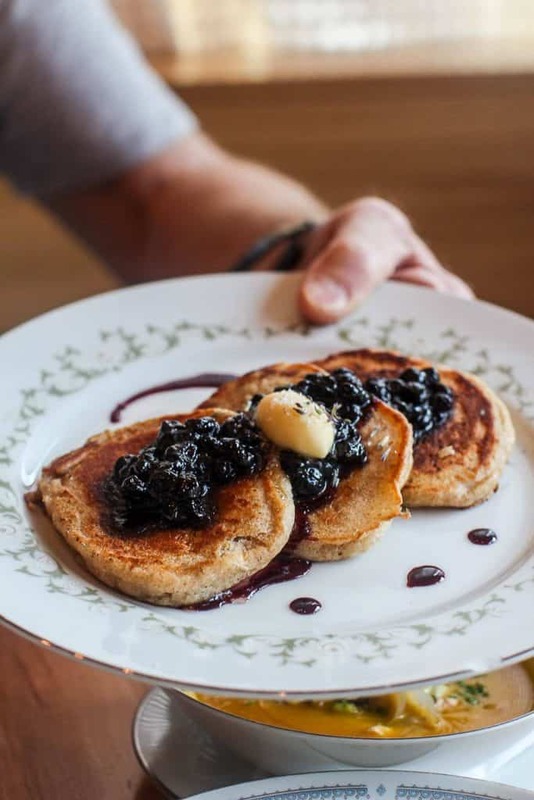 Consider heading to Beeswing in Cully for brunch in Portland because their menu boldly states “Brunch Daily 8 a.m. – 3 p.m..” Now that is a brunch restaurant and as a bonus, it’s in one of our best loved Portland areas, the earthy and playful Cully neighborhood. Beeswing has an amazingly creative menu including modern takes on the Benedict, delicious hashes, a burger and our personal favorite, the Scallion Pancake with poached egg, hollandaise, and braised pork belly. Definitely also try the Breakfast Enchilada, the Chicken and Waffles and the Cilantro Rice Bowl if you’re in the mood for something different that you wouldn’t in a million years whip up at home. If you’re not hungry for a full meal, you can choose from one of the many fine sweets in Beeswing’s pastry case, and if you wish round it out with a few sides such as creamed kale, smoked tempeh bacon strips, or one simple egg. 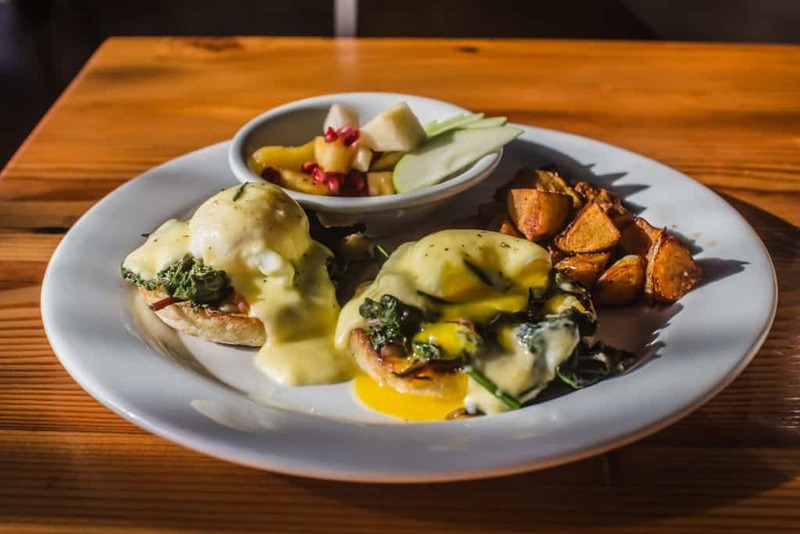 Are you looking to eat brunch in Portland every and any day of the week? Head to Tasty & Sons on Williams St. in North Portland or its brother restaurant Tasty & Alder downtown (moving soon to Southeast Portland) for some of the best food period in Portland and therefore luckily for us, some of the best brunch in Portland, period. 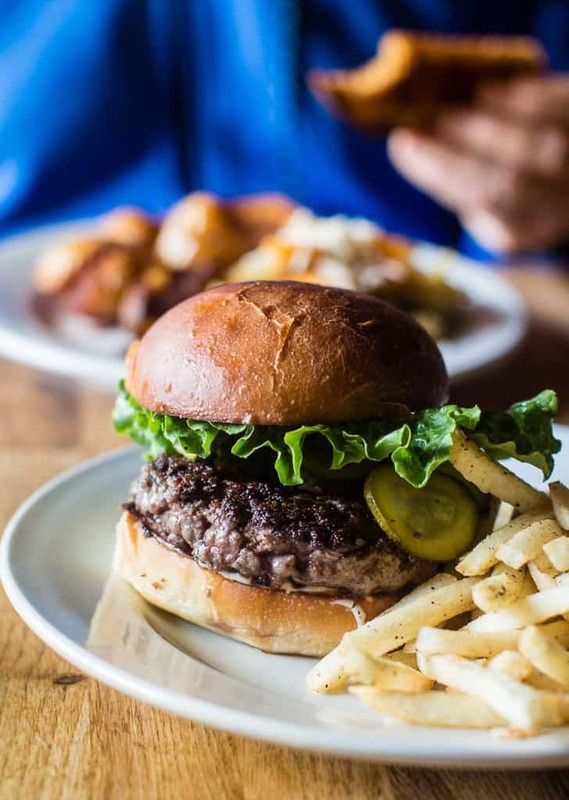 The Tasty brothers are part of one of Portland’s most well known dining groups, along with Toro Bravo, PLAZA DEL TORO and Mediterranean Exploration Company, Shalom Y’all, and Bless Your Heart Burgers. 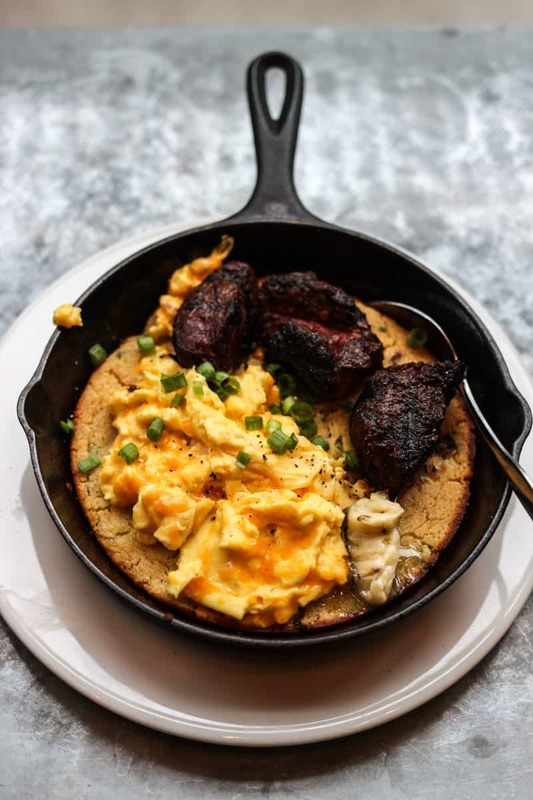 Their recent book “Hello My Name is Tasty” boldly states they are the restaurants who reinvented the brunch scene and moved the mid-morning meal trend away from eggs/toast/pancakes/biscuits etc. and towards, well, basically eating dinner for breakfast. The Tasty restaurants feature global diner favorites like Bim Bop Bacon and Eggs, Potatoes Bravas, Cowboy Ribeye, Grassfed Bavette Steak in Lettuce Cups, Kabocha Squash Enchiladas, Burmese Red Pork Stew, Hot Link Omelette and Monk’s Carolina Cheesesteak. Also chocolate potato donuts. Of course there is Korean Fried Chicken and Chicken Fried Pork Cutlet. You get the picture. The menus just go on and on and on, and you’ll never get bored or go home hungry. We like ordering a breakfast board (meats, pates and accompaniments) or a ton of sides to split like the cumin glazed yams, House Kimchi, Cowboy Beans, a donut or two, and then finishing with an order of Griddled Ingrid’s Rum Cake served with toasted pecans bacon and served Cheech and Chong style. 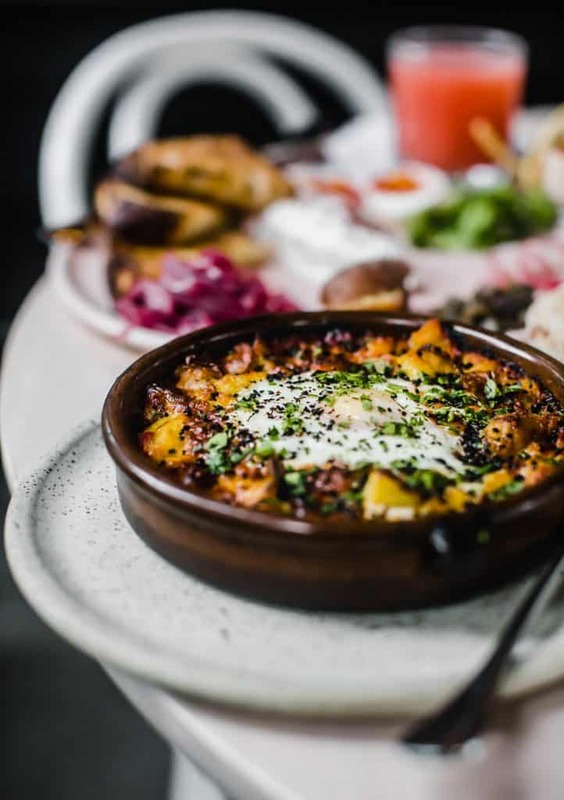 It’s best and worth it (the wait you’ll have, that is) to round up at least a few friends for brunch at either of the Tasty establishments so that you can try more dishes from the menu. My how you have grown, Country Cat. 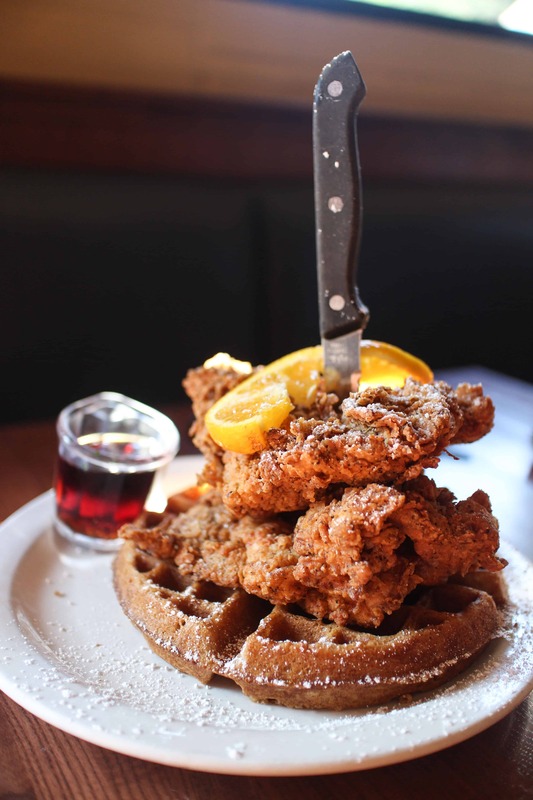 If you want to eat great fried chicken for brunch in Portland, you must visit Country Cat. You may recall seeing this fine Portland dining establishment featured on TV Food Network’s Diners, Drive-Ins and Dives with Guy Fieri back in 2013. Well . . . now you can see them in the PDX airport, which makes for a mighty fine layover or solution to your flight delay. Although Country Cat has amazing granola and pancakes and waffles, and you can get all the meaty hashes and main plates, as well as a ton of house-butchered bacon and lots of fun brunch drinks, the thing to get if you try nothing else here is the Fried Chicken and Spoonbread, period. 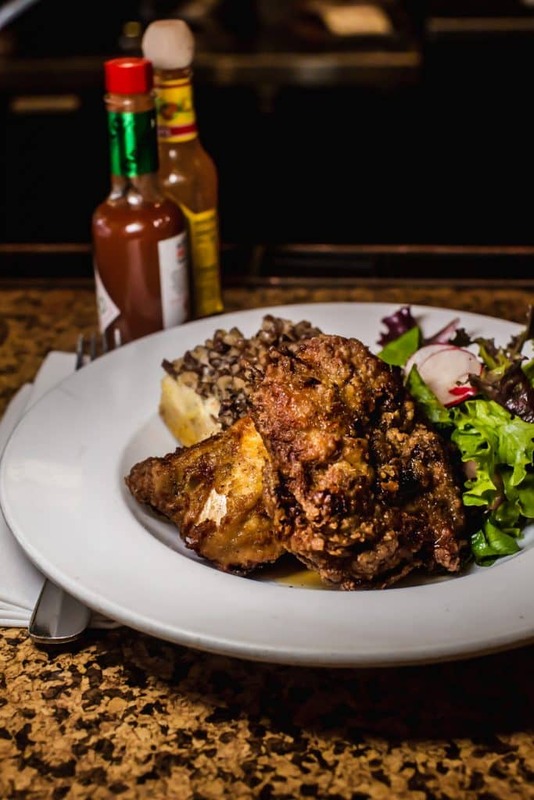 Country Cat serves some of our favorite fried chicken in Portland, and you won’t find a spoonbread this good anywhere else west and north of the south. Make sense? Bonus points for being located in Montavilla, far from the mobs of downtown and southeast and Alberta St., and filled with other fun eateries and off-the-radar shopping. Screen Door is the place your Uber driver will tell you to go for brunch in Portland. Everybody knows about it and chances are most have braved the legendary lines to eat there. 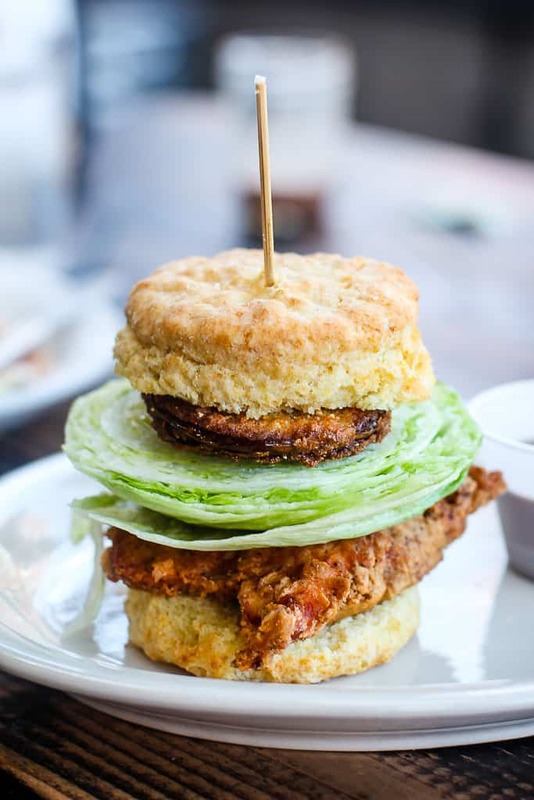 Screen Door serves up refined Southern specialties such as biscuits and everything, as well as their famous Fried Chicken and Waffles. Also noteworthy at Screen Door are the Lowcountry Shrimp and Grits, Po Boys, Fried Oyster Benedict, Bananas Foster French Toast. And now for a little something different for brunch in Portland. Where to even begin? Olympia Provisions is where you should go for a mid-morning meal built around their glorious meats and most notably, their sausages. Try the Bratwurst Hash with delicata squash, savoy cabbage, crispy purple potato, caraway butter and poached egg; a Grilled Kaserkraner sausage with potatoes and eggs; or the Yukon Potato Pancakes with breakfast sausage, pear chutney, chive sour cream and salad. 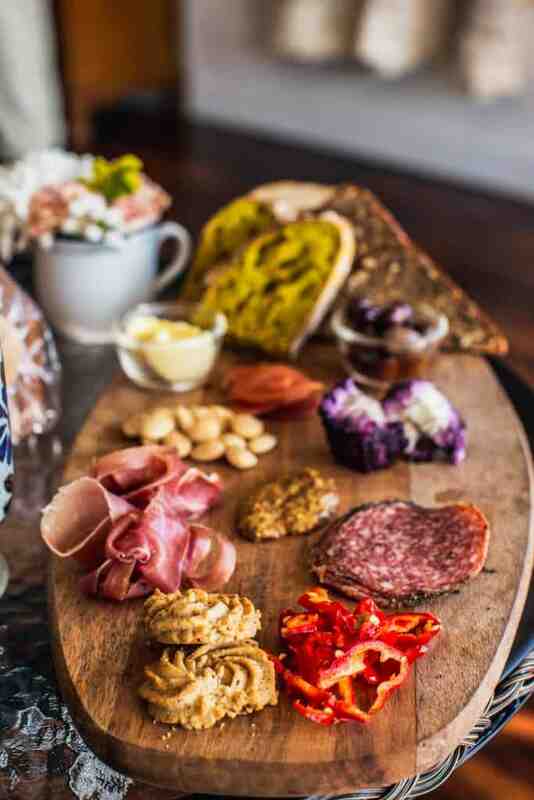 If you’re with a crowd, order a Charcuterie Board of 5, 8 or 11 meats, and throw in a 3 Cheese plate as well, with jam, pickle, fruit and toast. Start with some oysters or their Spicy Capicola Lox with pickled apple and fennel slaw with a few housemade everything bagels. Craving something more traditional? Try any of the 3 Eggs Benedict iterations with killer hollondaise and OP’s famous “laser potatoes” or the Omelette with bacon lardon, brie and non-hot habanero (“habanada”) pepper. For dessert throw in a couple of Baird Apple Cider Donuts and you’re done, and finally, shop for your weekday lunchmeats on your way out the door – they’ve got everything from mortadella to frankfurters and they’re all fantastic. It’s hard to overstate how great Tusk is and luckily for Portland brunch eaters, Tusk is not only open for brunch, but open an hour earlier than most brunch spots. 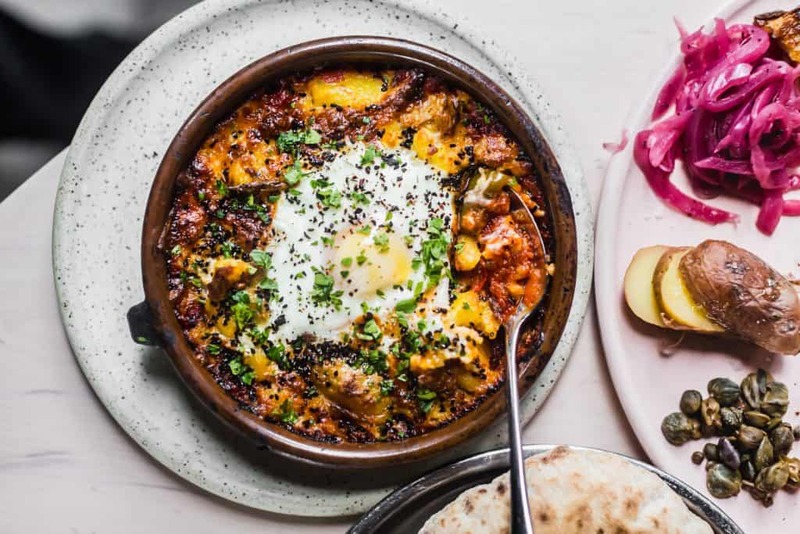 We think the one Portland brunch you must eat right now is Tusk’s Baked Cheese, a heftier answer to Shakshuka with screaming hot and pullable Oaxacan cheese under a baked egg and nigella seeds, and on top of smashed potatoes and tomatoes. There just aren’t any hit-and-misses here. The food is consistently flat-out delicious, the tastes are sharp and bright; the ingredients are as fresh and local as possible, the vibe is modern and joyful, and the plates served up are beautiful. “Aggressively local” Tusk is a Mediterranean influenced, farm-forward restaurant opened in late 2016 and shortly thereafter named Restaurant of the Year (2017) by Food and Wine Magazine in their yearly profile of the most exciting and hottest places to eat in the U.S. Why? Because the food is that tasty. And creative. And healthy. And pretty. Chef and co-owner Sam Smith, formerly of Philadelphia’s famed Zahav, teamed up with Ava Gene Restaurant Group’s Josh McFadden and Luke Dirks, to bring the Pacific Northwest its very own Mediterranean food mecca in this light-filled and buzzy space. One thing we love about Tusk is the flatbread and hummus which sounds mundane but is anything but, and which is also a nice foundation to build a shared meal when you add other flatbread friendly dishes or sides such as baked cheese and eggs, greens, lamb sausage, bacon, smoked cod, olives, feta, and/or greens. No forks required, just lap it all up in your flatbread. A nice composed alternative to this idea would be the Cypriot entree, with sunny eggs, olives, feta, a little salad and lamb sausage. 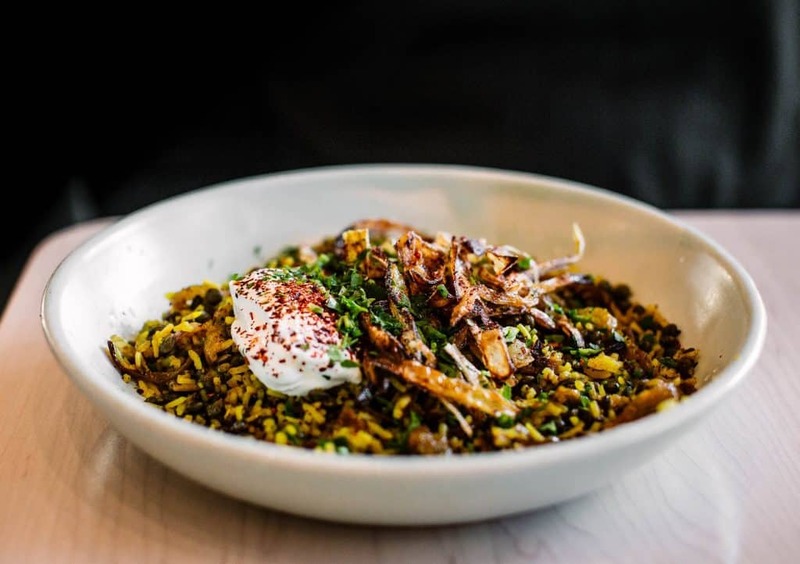 Another absolute favorite and must-order is the not-often-seen and classic Israeli dish Mujadra, a savory and homey bowl of rice, lentils, crispy onion, labneh, sumac and fried egg that is impossible to stop eating. If you’e thinking sweet thoughts, try the killer Pistachio Gooey Cake, an ode to the famous St. Louis “mistake” cake that was borne of a cooking err that bred instead of a cakey cake, a gooey cake. Tusk is one of only two places in Portland that we know of that you can get your midwestern fix of gooey cake, so by all means do try it. Other stand-outs in the sweeter department are the seasonally changing Dutch Baby, Yogurt or Chia Seed Pudding, Cinnamon-Sugar and Halva Toast, seasonal crumb cakes or scones, and soft-serve sundaes (Salted Caramel Sunchoke!). Understandably, Tusk is popular, so if you do go, try to go early at 9:00 a.m., and if you’re a party of 8 or more, you may make a reservation. Do go though, no matter how or when, it will be one of your best meals in Portland.